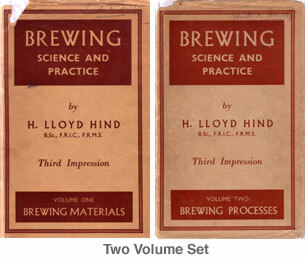 In 1936, perhaps the leading British brewing scientist of the mid-century, H. Lloyd Hind, wrote a review of technological developments in British breweries in the last 50 years. It was published in the Journal of the Institute of Brewing, here. One of the endearing traits of the piece, and perhaps of the English beer ethos as it was (and perhaps of the English people as they were), was noting where European innovations had made little dent in English practice. He explains for example that 70 years before, a description of the Burton “unions”, the system of linked open casks to clarify beer, could apply virtually unchanged to Burton production in his day. Of course some things had changed, he explains for example that use of wood in brewery fittings had declined very significantly (storage vats, fermenters, etc.). Where wood was retained it was often lined. One area where the English remained notably impervious to the blandishments of European science was pure yeast culture. The Dane Emil Hansen’s legendary work in 1883, showing how a pure strain could be cultivated from the mixed lager yeasts then in use, made little impact on British brewing. Hind notes that most English breweries carried on with their traditional mixed culture. The reason he gave is instructive: they feared the flavours produced in their beers would change with adoption of pure yeast culture. Although he expressed it with tact, Hind made clear such flavours were not always ideal. Mixed strains had the potential to result in unplanned flavours, even spoilage. Also, attenuations could not be as accurate as with a pure culture yeast. Nonetheless as consumers in a brewery’s trading area had become accustomed to the flavour, this was a satisfactory arrangement. Belgian brewers were similar, up to quite recently anyway. The end result of this process was a range of flavours, something partaking of the nature of gastronomy but not in any planned way. In 1977 when Michael Jackson wrote his landmark The World Guide To Beer, that range of flavours was still evident in bitter ales produced by those breweries. Jackson said some beers were on the sweet side, some “cabbagey”, some “sickly”, some “toffee-like”, etc. Of course yeast was not the only factor in such tastes, but it is an important one and can affect for example perception of hop bitterness. Hind stated that one or two brewers used mixed strains composed of selected pure yeasts, but even that was a distance from what Hansen urged of English brewers. Most stuck with their old system. This had its risks with the seeming oddity – it depends how you look at it – that at different times of the year the strain would differ in composition. This implied the beer was better at some times than others. All this resulted from ancestral methods of yeast “management” and that most plants then were not sterile in the modern sense. Guinness for example didn’t change to fully sterile plant until after World War II. With a depression and soon a world war to deal with, Britain had other objectives and priorities than bringing brewery yeast management into line with European practice. That did finally change. At Ind Coope in Burton, as this 1966 article by T.J. Stevens shows (also from the Journal of the Institute of Brewing), pure culture yeast had recently been adopted, with good results. In particular it was noted the conditioned beers had less haze than with the former yeast used. The article makes no reference, unlike Lloyd Hind’s, to the issue of flavour. Presumably though the lab people worked with the marketers and pub managers to ensure that taste stayed within acceptable bounds. But it took another 30 years for the English to change in this regard – something admirable IMO. The concern to maintain traditional flavour clearly was the primary reason the change was delayed so long. Today, my understanding is – please correct if I’m wrong – almost all yeast used in top-fermentation brewing is pure culture yeast. Perhaps it is different still in Belgium, but I doubt it. In distilling, use of pure culture yeast is a given in the industry. In a few cases, a brewing yeast supplier will offer a mixed strain. You see an example here where White Labs offers the California ale yeast combined with another strain to produce a rounder, more lager-like taste. Maybe some craft breweries use an evolved mixed strain which they keep going by yeasting-back or culturing up from the jug for the next brew. Whether their beer is better than produced with a selected single strain can only be tested “in the field”, by comparison of taste. But also, other brewing characteristics must be taken into account such as attenuation, flocculation, hazing, temperature and energy consumption. As in anything, brewers weigh different factors and make choices: no one factor can be determining. Note re image: the image shown was sourced at this book vendor site, here. All intellectual property thereto or therein belong to the lawful owners or authorized users. Believed available for educational or cultural purposes. All feedback welcomed. A few British breweries do still have a multi-strain yeast – Adnams and Harvey’s spring to mind. Harvey’s beer is particularly complex. In general though, yes, most use a pure culture strain, and the number of brewers who even bother to maintain a house yeast is quite small, with many even pitching dried yeast.